According to a new market report published by Transparency Market Research titled Consumer Pressure Washer Market - Global Industry Analysis, Size, Share, Growth, Trends, and Forecast, 2016–2026, the global consumer pressure washer market is expected to reach a value of US$ 2,048.4 Mn by 2026. In terms of value, the market is estimated to expand at a CAGR of 3.5% during the forecast period from 2018 to 2026. Increasing commercial services and disposable income of consumers is expected to drive the market growth of consumer pressure washers over the forecast period. The growth in the global car washing industry is expected to fuel the demand for consumer pressure washers for the automobile industry along with the expected increase in residential usage during the forecast period. Unlike conventional methods of washing, consumer pressure washers are capable of saving water and thus go a long way in addressing the global water crises. This in turn increases the adoption of consumer pressure washers in the residential and commercial sector. 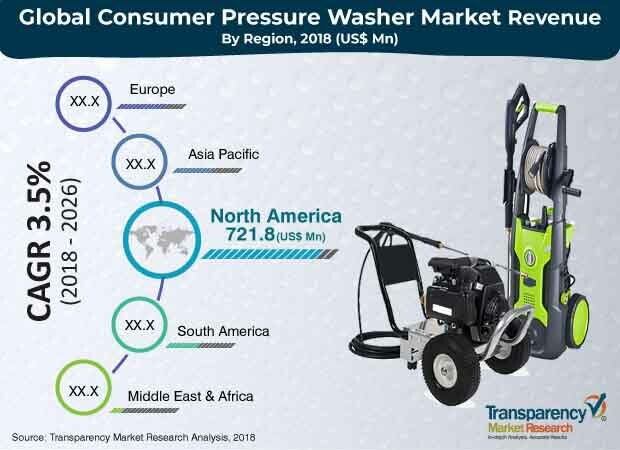 In addition, product development, modification in new products to increase efficiency of pressure washers, and capturing untapped markets is expected to fuel the demand for consumer pressure washers over the forecast period. High cost of consumer pressure washers and availability of substitutes such as foam based cleaning, and sandblasting cleaning equipment is expected to hamper the market during the forecast period. Noise emission by pressure washers hinders the growth of the market across the globe, due to environmental concerns. Electric consumer pressure washer segment is expected to hold the largest share in terms of revenue by the end of 2019 and is also projected to grow steadily over the forecast period (till 2026). Electric pressure washers are portable and compact, and hence are convenient to use. Electric pressure washers are preferred for residential use due to their affordability and convenience. Gas pressure washers are used for commercial purposesdue to their ability to handle medium to heavy capacity. Increasing number of washing centers, swimming pools, and gardens will fuel the demandfor consumer pressure washers during the forecast period. Online channel of distribution is anticipated to have a CAGR of 4.3% due to increasing mobile adoption rate and digital marketing across the globe. E-commerce platforms such as Amazon and Alibaba will show significant growth due to a variety of pressure washersoffered by them. In addition, these e-platforms provide various discounts and offers. Offline channel is expected to have a CAGR of 3.49% by 2026. The consumer pressure washer market in Asia Pacific is expected to witness the highest growth over the forecast period due to changing lifestyles and higher disposable income, coupled with greater affordability which has increased the demand for consumer pressure washer systems. Themarket in the region is expected to witness growth at a CAGR of 3.7% in terms of revenue during the forecast period.The region comprises more of middle class consumers; therefore, consumer pressure washers are expected to see high demand during the forecast period.Among the countries of Asia Pacific, Japan is anticipated to dominate the consumer pressure washer market over the forecast period. The market in India and China are projected to witness considerable growth rate during the forecast period due to the increasing population and growing nuclear families. The consumer durables industry in India and Japan has witnessed substantial change in the past couple of years. North America holds major share in the global pressure washer market due to increasing growth of building exterior cleaning industries. Europe is expected to have the second largest market share in terms of growth rate due to better lifestyles, increasing disposable income, and infrastructure. Middle East & Africa is expected to have lower CAGR due to lack of water resources and strict rules and regulations framed by the governments. Some of the major players in the global consumer pressure washer are AR North America, Karcher, Snow Joe, Nilfisk , Clearforce etc.